Russian violinist and conductor Vladimir Spivakov. Famous violinist and conductor founds contest for young people. 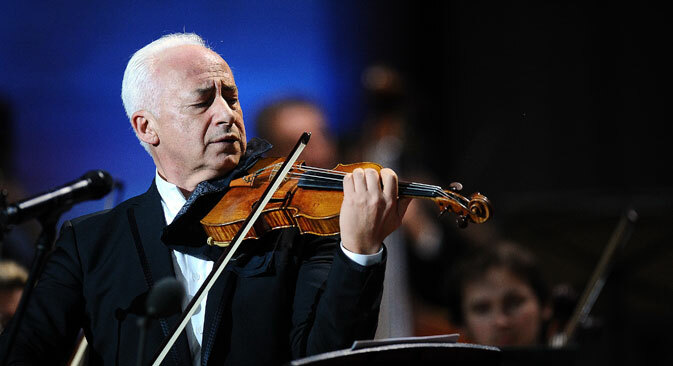 The famous Russian violinist and conductor Vladimir Spivakov is one of the founders of the new International Violin Competition to be held from May 10-17 in the southern Urals city of Ufa. Young violinists between the ages of 15-26 from around the world are invited to take part in the competition. They can apply on the official website. The deadline for applications is March 20, 2016. The winner will get a violin by Carlo Giuseppe Oddone made in about 1890. The second-place contestant will be awarded a violin by French master Alain Carbonare, as well as $5,000. The prize for third place is a violin made by Maria Strelnikova (who has a workshop in Cremona, Italy) and $3,000. Among other special prizes are invitations to participate in international musical festivals in Colmar, France and Moscow, Ufa and Perm in Russia. The Russian-American violinist Mikhail Kopelman will lead the jury. The full panel of judges is to be announced in February 2016.